There are presently 4820 teacher vacancies and 132 vacancies for principals in northeast schools, a conference held Saturday at the provincial education ministry auditorium in Trincomalee and presided by the Sri Lanka's Minister for School Education Mr.Suranimala Rajapakse, was told. 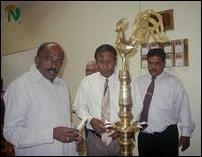 School Education Minister Mr.Suranimala Rajapakse (left) lighting the traditional oli lamp at the Trincomalee conference while Provincial Education Ministry Secretary Mr.R.Thiagalingam (centre) and Provincial Director of Education Mr.S.Mahalingam (right) look on. Minister Mr.Rajapakse tabled a document at the conference giving the strength of teachers and principals in the northeast province. According to the document supplied by the provincial education authorities, 19,194 teachers are currently serving northeast schools. The minister held two conferences Friday at Vavuniya and Saturday at Trincomalee to review the progress of the General Education Project funded by the World Bank in the northeast province. Zonal education officials and other related officials of the northern province participated at the conference held at Vavuniya. 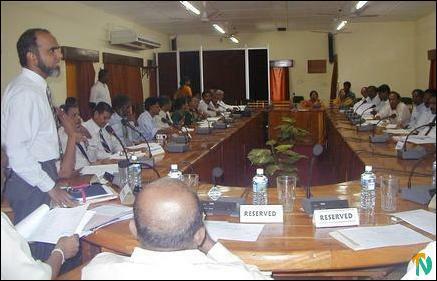 Zonal education officials of the eastern province participated at the Trincomalee conference, sources said. 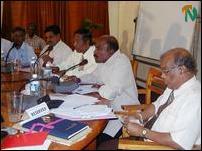 Minister Mr.Suranimala Rajapakse (second from right ) speaking at the conference. GEP Project Director Mr.K.Mohamed Thamby, School Education Ministry additional secretary Mr. G.B.H.Liyanage also participated in the two conferences, which reviewed the shortcomings in the implementation of the GEP proposals in the province, sources said. Provincial Education Ministry Secretary Mr.R.Thiagalingam delivered the inaugural address. World bank funded General Education Project director Mr.K.Mohamed Thamby speaks to zonal directors of education, and divisional education officials, attended the conference.